Where and when does inspiration come from? Yes, it's a trick question (the answer is everywhere and anytime) but it's still worth considering some of the myriad possibilities. For Duane Michals, one of my favorite photographers, the inspiration comes well before he even picks up a camera. He visualizes complete storylines and only then produces the multi-image series by constructing the stage (mostly in his apartment), photographing the actors and printing the images. Jerry Uelsmann, on the other hand, creates most of his whimsical photomontages in the darkroom, drawing his inspiration from the large archive of negatives that he has shot over the years; using up to a dozen enlargers and extensive darkroom manipulation for a single print. My own inspiration for this week's POTW was a string of early morning mishaps. I had burnt the toast (setting off the smoke alarm), broken a juice glass and cut my finger when tossing the mess into the sink. 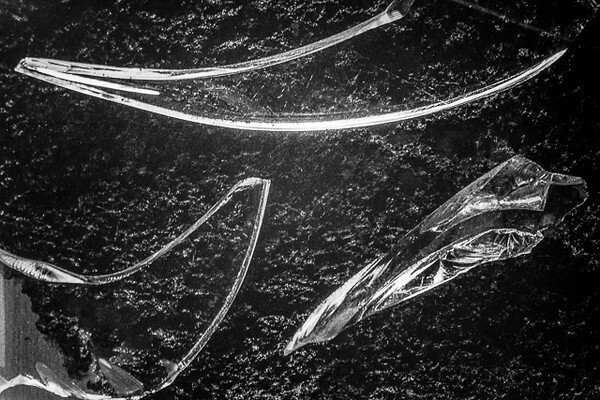 While standing there bemoaning my clumsiness, I noticed the first light pouring in through the window, transfiguring the curved shapes of the shattered glass into sparkling highlights and reflections that starkly contrasted with the lava-like texture of the blackened toast. The abrupt transformation of a bothersome mess into a visually compelling image was both unexpected and delightful. And so begins a new long-term project (inspired by this 40-year old image of burnt toast and broken glass) that will portray those early morning accidents that make you want to go back to bed. Eggs will be broken, coffee will be spilled. Stay tuned -- this should be fun.